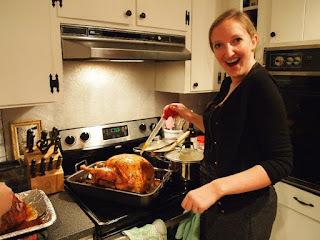 Young and Entertaining: Friendsgiving...learn from my mistakes! 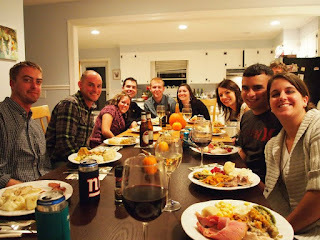 Through the years, Friendsgiving has become something of a tradition in my circle of friends, which I absolutely adore. It's a time to get together before everyone parts ways for the holiday, enjoy each others company, and test drive some new recipes without the pressure of getting up a few hours later for black friday shopping. I must admit, my actual Thanksgiving is quite leisurely. Typically, I spend the day watching the parade, eating scrumptious appetizers, and drinking wine with my mom while my sister, Sara, prepares a turkey dreams were made of; and my sister, Laura, creates her annual "tablescape". I just love it! Friendsgiving, however, is a time for me to hone in on my culinary skills and entertain in my home. 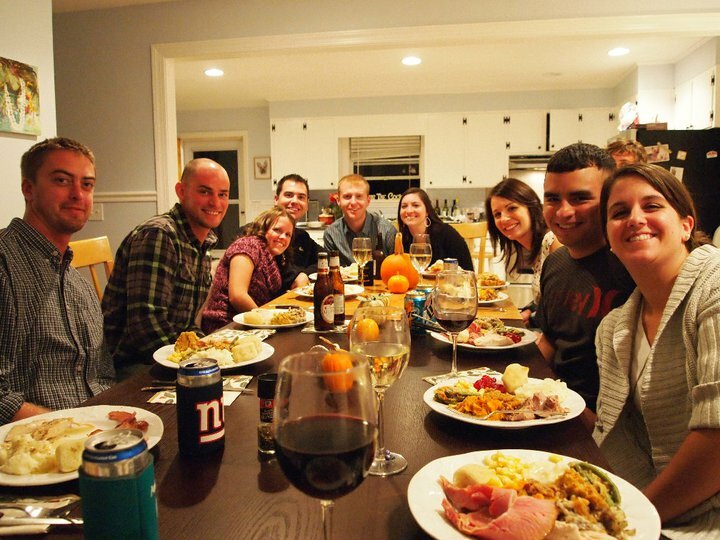 Here's a look at Friendsgiving through the years, and a few lessons learned along the way. 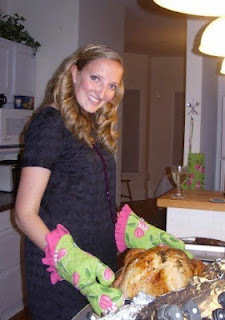 <- This was my first annual turkey day. SO many rookie mistakes! The turkey was completely raw inside and my guests were STARVING at about 9pm. The key is giving plenty of time to thaw the turkey. Little did I know a 28lb turkey would take about 5 days to thaw! Don't try to cheat, as I did, and put it in the oven if it's even the slightest bit frozen. It will not cook evenly, and it will be devastating. If your turkey is still frozen the night before, put it in a pot of cool water and change the water every 30 minutes until it is thawed. If all else fails and the turkey is raw and all the sides are done, slice it, microwave it, and know that you will never make the same mistake twice! Year two: turkey perfection. Rookie mistake: assigning sides to my [guy]friends without consulting them. Just know that they will likely be watching football all day, drinking, and they will show up with hot baked (canned) biscuits in a plastic bag. They will be soggy. Solution: Just do everything yourself until they have girlfriends who will bring adequate sides! That is, assuming you are a control freak like me. Of course, these days, I just ask who wants to bring what. Remember that everyone has different traditions and may like some unique sides. You can always make new tradition! Year Four: The tradition is official! I can safely rely on Annie to make her grandmothers cornbread dressing. Her husband Chris, makes amazing gravy. Lindsey will bring her mashed potatoes (but will she ever give up the secret ingredient? I'm still working on that). Stephanie will bring the candied yams, and we will try to figure out the difference between yams and sweet potatoes. Tara will DEMAND mac n' cheese like her parents make for thanksgiving, and somehow we will have the ingredients to make it at the last minute. In the end, nothing will ever be perfect. Sometimes the turkey will be raw. The sides will get burnt. The smoke detector will go off. But no matter what, I will sit down with these wonderful people, at this makeshift table, and remember what this holiday season is all about. Stay tuned for this year's Friendsgiving update!